Mufti Mohammed Ibrahim Mohammed Rizwe, a renowned scholar from Sri Lanka, not only known locally but widely acclaimed in India and has traveled worldwide on various educational and religious missions to bring together Muslims and other religious communities to a common platform to serve the humanity. In respect to his educational background, Mufti Rizwe completed his primary education at Kingswood College, Kandy, Sri Lanka. During his school days, he excelled in various sports including Hockey, Soccer, Rugby and Karate. Thereafter, he pursued his higher studies at Jamiyathul Uloomil Islamia, Binnoori town, Karachi, which is an affiliate of the Higher Education Commission in Karachi, where he completed his Al Alimiyya Course and double Masters in Islamia and also in Arabic. As a specialization program, he also pursued on the Islamic Jurisprudence (Al Takhasus Fiqh Al Islamia) and completed it successfully and become a specialist in the subject of Fiqh. Spent a year with a team under the leadership of Moulana Ilyas (Barabangi) in Delhi Research and writing commentary on ‘The Hayathus Sahaba’ (The Lives of the Sahaba) written by Moulana Yusuf Kandhalawi. He started to serve the community as a Teacher at ‘Jamiah Rahmaniya Arabic College Akurana, Sri Lanka. He is currently (at the time of this writing in 2011) the President of the All Ceylon Jamiyathul Ulama (ACJU) and has contributed immensely towards building a name and repute for the Apex body that brings all the Ulama from various schools of thought together to work towards upliftment of the society. ACJU have served the country without any religious bias whenever its services were required. Currently the ACJU comprises of Nine Committees to handle issues related to Islamic Finance, Fatwa (Opinions), Halaal, Propagation, Social Services, Hilal (Moon-sighting), Information, Publications, & Education. Sheikh Rizwe also heads numbers of educational institutions for both boys and girls to guide and advice them, whilst giving the leadership that is required to take those institutions to another paradigm. He also sits (currently) in a number of Islamic financial institutions which are Amana Investment Ltd, Takaful Ltd, Bank of Ceylon and Peoples Leasing as a Member of the Shari’ah Supervisory Board. 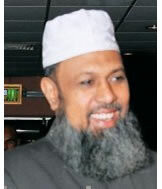 Since 1996 he was the lecturer of the ‘Kulliyathul Rashard Arabic College – Colombo - Lecturing in ‘Dhaurathul Hadheeth’ teaching Kuthubul Siththah – the six authentic books of Hadith’, He holds the various positions in several institutes as President of the ‘Kulliyathul Humaidhiya Arabic College’ at Urugodawatte in Colombo, President of the ‘Haiathul Quran’ – run under the patronage of Rabita al-Alam al-Islami- in Colombo 6, President of the ‘Madrasathu Tarbiyyathil Banaath’ in Wellawatte, Colombo, Patron of the Ma’had Zuhair lil Muslimaath, Dehiwala, Patron of the Darul Quran Foundation, Colombo, Director of ‘Bareera Arabic College’ in Akurana, Advisory Board Member to the ‘Darul Uloom Islamiyya’ at Colombo 6, Member of Majlisus Shurah of Kulliyathi Ibnu Umer Arabic College, Advisor to ‘Kulliyathul Ain’, Colombo, Member of Supreme Council of ‘Madaris Ul Arabiyya’ (Federation of the 190 Arabic Colleges in Sri Lanka), Member of Supreme Council of Congress of Religions. He has travelled to the following countries for the purpose of Islam Awareness, Islam Education and Islamic Dhawa in Bangladesh, India, Indonesia, Japan, Malaysia, Maldives, Pakistan, Singapore Saudi Arabia, UAE, Egypt, Kenya, South Africa, Belgium, England, France, Germany, Holland, Switzerland, United States of America and Canada. He is a renowned speaker at various Islamic forums on various topics related to Islam, education and other community related issues to encourage different communities and ethnic groups in a multi-ethnic society to live in harmony without any religious bias or hatred.